Wanna See Alyssa Valdez, Denden Lazaro, Jeron Teng, Manny Pacquiao, and Other Stars on Sunday March 1? Check This News Out! 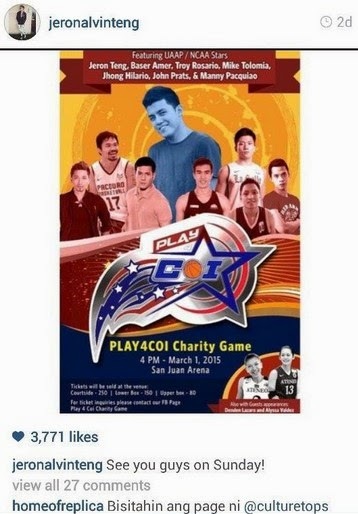 Insta Scoop: Alyssa Valdez, Denden Lazaro, Manny Pacquiao, Jeron Teng, Jhong Hilario, Baser Amer,Troy Rosario, John Prats, Mike Tolomia and other stars will be present in the PLAY4COI Charity game on Sunday, March 1 (Sunday) at the San Juan Arena. Please spread the news!